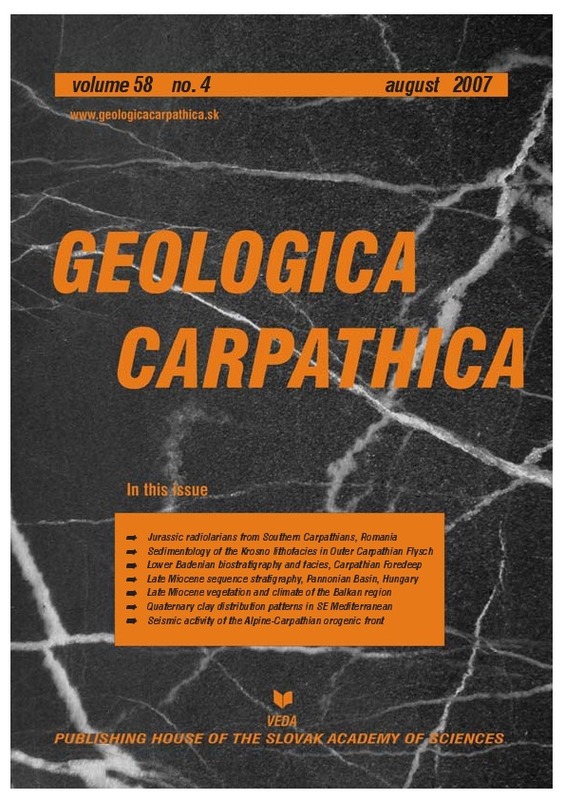 Abstract: The biostratigraphy and paleoecology of the Middle Miocene, Lower Badenian deposits were studied in two boreholes (Ivan-1 and Vranovice-1) situated in the southern part of the Carpathian Foredeep, Czech Republic. Planktonic foraminifers document the M5b Zone of Berggren et al. (1995). Presence of Uvigerina macrocarinata Papp et Turnovsky and Praeorbulina glomerosa circularis (Blow) indicates “Lower Lagenid Zone” sensu Grill (1941). Calcareous nannofossils with Helicosphaera waltrans, H. walbersdorfensis and Sphenolithus heteromorphus give evidence for the NN5 Zone of calcareous nanoplankton (Martini 1971). Quickly changeable paleoenvironment, especially sea-level fluctuation and non-stable conditions are documented by five types of microfauna: 1. shallow-water foraminifers accompanied by fragments of molluscs and bryozoans — shallow sublittoral (infralittoral), 2. joint occurrence of agglutinated and calcareous benthic foraminifers — circalittoral to upper bathyal, 3. euryoxybiont foraminifers indicate low oxygen content in bottom water of the deeper sublittoral (circalittoral), 4. dominance of planktonic foraminifers with pyritized tests — low oxygen sea, circalittoral to upper bathyal, 5. mixed assemblages of shallow- and deep-water foraminifers document slumps. Generally, relatively shallow epicontinental sea of normal salinity with nutrient supply is supported by coastal nannoflora with higher numbers of Reticulofenestra minuta, Coccolithus pelagicus, and helicosphers. Low abundances of sphenoliths and scarce occurrence of discoasters may imply cooler surface waters. High numbers of reworked nannofossils reflect transgression. Abstract: In the area of the Danube–Tisza Interfluve, Pannonian Basin, Hungary, sedimentological, paleontological and well log interpretations of fully cored boreholes made it possible to establish the sequence stratigraphic subdivision of the Upper Miocene lacustrine and fluvial sections of boreholes Kaskantyu Kas-2, Janoshalma J-1 and Bacsalmas Ba-1, of which Kas-2 is paleomagnetically dated. 8 sequences were determined in borehole Kas-2 and 6–6 ones in the boreholes J-1 and Ba-1 respectively. The correlation of the sequences was made along two independent composite seismic lines with the help of cross seismic profiles and well logs of 29 boreholes. 11 sequences were marked out in the Upper Miocene basin fill. The areal distribution of the sequences reflects the NW–SE direction of the sediment transport. By the time of maximum flooding surface (MFS) 2, the area was almost completely flooded. The oldest 4 sequences were identified in a seismically observable thickness in the NE Kiskunhalas depression. Their condensed layers are present in the well Ba-1 in the SE part of the area, revealed by dinoflagellates. Sequences 5 to 11 are present in well-observable thickness in the study area. The thickest part of the successive sequences is shifting towards the SE. Sequences 8 and 10 are developed only in the eastern part of the area. The basin evolution had two major phases: from 10.2 Ma to approximately 7.6 Ma the sequences 1–4 were characterized by local sediment accumulation despite their complete water cover, while between 7.6 and 6.6 Ma (sequences 5–10) regional sedimentation occurred. Abstract: The results of palynological studies of Neogene freshwater deposits of the Beli Breg Graben (West Bulgaria) are presented. We analysed pollen and spores with the aim of obtaining data about the composition and structure of fossil vegetation and climate conditions. The main vegetation paleocommunities, which existed during the fossilization process, are characterized as mixed mesophytic and swamp forests, communities of aquatic plants, and herbaceous paleocoenoses. The climate data reconstructed by the Coexistence Approach indicate a warm temperate climate with mean annual temperatures around 16 ºC and with mean temperature of at least 4 ºC during the coldest month. With annual precipitation rates commonly above 1000 mm climatic conditions were overall humid, although partly seasonally drier conditions are evident from the data. Abstract: The seismicity of the geological complexes of the northern part of the Eastern Alps, the Western Carpathians and the Bohemian Massif is investigated by means of new seismic stations and a review of earthquake catalogues available. Eleven earthquake catalogues are evaluated and checked for multiple entries, fake earthquakes and mistakes. The final data set of earthquakes covers the time span from 1267 to 2004 and comprises 1968 earthquakes in total. The resulting epicentral map provides a very detailed idea of the seismicity of this region. An attempt at a seismo-tectonic interpretation of earthquakes based on the geological overview of the region is presented. Gravity and airborne magnetometry data in addition to seismic events are collected and cross-border maps are compiled and analysed in order to determine the spatial extent of these geological structures. The Linsser filtering technique is used to trace faults at two depth horizons — 4 and 8 km. Correlation between the epicentres of earthquakes and lineaments derived from gravity data is discussed for major historical earthquakes such as Neulengbach (1590) or Scheibbs (1867). This data set enables us to determine seismically active fault structures and to get an insight into the fault system interaction. The ability to assess the potentially seismically active vertical and horizontal extent of fault structures enables improved hazard assessments in future. The magnetometric map shows a belt of positive anomalies which reflects the presence of magnetized rocks between the Bohemian Massif and the Alpine-Carpathian zone.